China plans to set a lower economic growth target of 6-6.5 percent in 2019 compared with last year’s target of “around” 6.5 percent, policy sources told Reuters, as Beijing gears up to cope with higher U.S. tariffs and weakening domestic demand. Data later this month is expected to show the Chinese economy grew around 6.6 percent in 2018 – the weakest since 1990. Analysts are forecasting a further loss of momentum this year before policy support steps begin to kick in. The central bank is likely to pump out more cash by further lowering banks’ reserve requirements, following a broad-based cut this month, while trying to funnel more credit to small and private firms – vital for growth and jobs, policy sources said. As well as external pressures from the trade war, deal or no deal, the damage is done on that front. 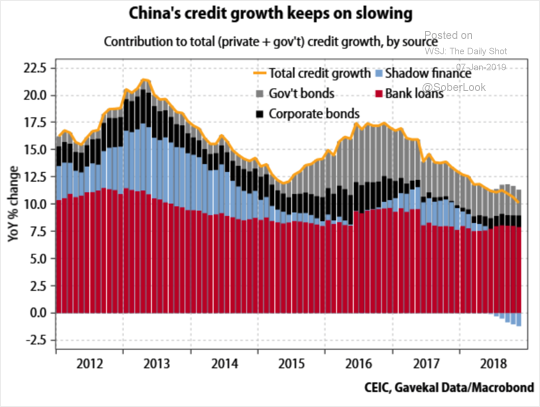 As said before, China is loath to go all-in for stimulus again. Cutting the growth target is hardly preparing the ground for a tsunami of more stimulus. It may, in fact, not move on such again until a global recession forces it to. I still think bulk commodity prices will reset lower this year.